Right after the first freeze is the ideal time to transplant cedars. Even though the native cedars are tough and obviously well-adapted, they do have a minor flaw at transplanting time. They need more water than you would guess. Don't over-water but make sure the trees are thoroughly soaked after planting with the natural planting techniques and add a light covering of horticultural cornmeal to the surface of the backfill before applying the topdressing mulch. 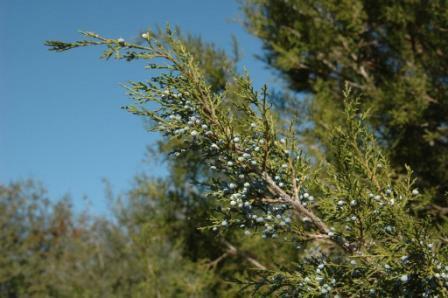 HEIGHT: Eastern red cedar grows 40 to 60 feet. Red and ash junipers grow to approximately 20 feet. SPREAD: Approximately 15 to 20 feet. NATURAL HABITAT AND PREFERRED SITE: All three of these junipers prefer the rocky alkaline limestone soils but adapt well to deeper more healthy soils and landscape situations. They all need full sun and they are all 3 are able to take low water situations. Ashe juniper is thicket forming to create cedar “brakes”. Ashe juniper is more spreading and has a candelabra-like or multi-trunked structure usually. It also stiffer twigs and more fragrant foliage. Red cedar also has multiple trunks from the base. Eastern red cedar usually has one main trunk. Red and ashe juniper are more rounded and bushy from youth to maturity. 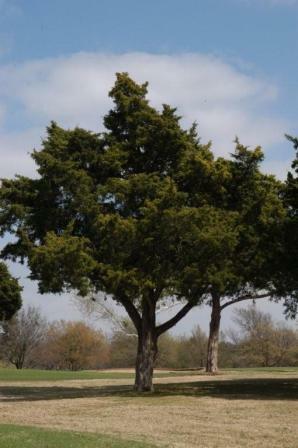 The eastern red cedar tends to be Christmas tree shaped when young and then spreading into a more typical shade tree structure with maturity. Red juniper tends to be more slender and erect than the ashe juniper although it is quite similar. FLOWERS AND FRUIT: Cedars have small unimpressive flowers in the spring followed by small blue/purple berries in the fall on female plants. Red juniper has reddish or coppery brown fruit. The other two have blue fruit on female plants. Male and female flowers are on different plants (dioecious). Catkins on male plants are small. Female cones are rounded and very tight. Fruit ripens in the fall. The cones are berry-like and pale blue, sweet and resinous. Fruit from all the junipers are eaten by many species of wildlife. BARK: Light reddish brown that separates into long fibrous shaggy strips. FOLIAGE: All three have the same dense evergreen foliage, leaves are scale like. CULTURE: Native cedars are easy to grow in most well-drained soils but they do the best in the black and white soils. They need excellent drainage but little water and fertilizer. PROBLEMS: Eastern red cedar is the alternate host for cedar apple rust. PROPAGATION: Cedar can be easily grown from seed. The small cones are gathered in the fall. They don’t need any special treatment and should be planted in the fall. INSIGHT: Eastern red cedar does not resprout after cutting or burning. Ashe juniper is harder to eliminate by fire and cutting down. It has had a more significant negative impact on ranchland in Texas than the other two species. All the junipers – but especially the ashe juniper – have occupied the steepest hillsides in canyons where they are protected from fires. The narrow strips of bark from ash juniper are a primary nesting material for the golden-cheeked warbler. Wood from these trees is used to make cedar chests and cedar lined closets due to its insect repelling quality. Eastern red cedar is excellent fence post material. The ashe juniper is resistant to the cedar apple rust but creates the biggest cedar allergy problem resulting from the pollen of male trees in the winter months. Alligator juniper (J. deppeana) Grows at high altitudes and easily identified by the rough textured checkered bark. 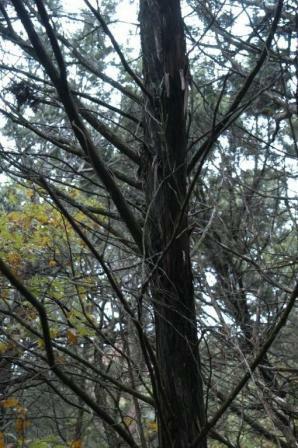 A very long-lived tree that resprout from stumps like the ashe juniper. Drooping Juniper (J. Haccida) is a graceful juniper with drooping branches creating almost a wilted appearance. It grows in the Big Bend. One-seed juniper (J. monosperma) is a multi-trunked juniper that grows on the northern plains and the Trans-Pecos. It is similar to ashe juniper but has smaller blue-black to rust female cones or berries.